Sesame oil has been used as an important Ayurvedic medicine from time immemorial. The modern beauty and healthcare specialists have also recognized its benefits for treating different ailments. The oil is abundant in vitamin E and thus is an excellent anti-oxidant. It also contains a high amount of vitamin K, magnesium, copper, zinc, calcium, iron, and vitamin B6. 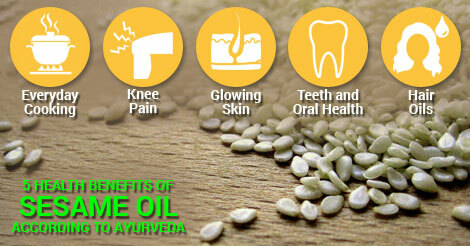 Father of Ayurveda, Charaka, has identified sesame oil as the best oil to provide strength and oiliness to the body. He also mentions that sesame oil reduces Vata and Kapha dosha in the body. Here are 5 most important benefits of sesame oil which can be really helpful in day-to-day life.